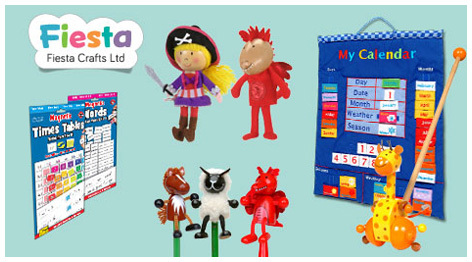 Fiesta Crafts is passionate about creating toys that children will love to play with time and time again. Across their diverse range of over 250 products, you will discover toys to thoroughly engage babies and children with ‘proper’ play and help them learn and develop skills along the way. Two brothers, Andrew and Richard Bacon have been at the helm of Fiesta Crafts since the idea of importing wonderful, colourful fabric toys came to Andrew on a trip to the Far East back in 1990. The company has gone from strength to strength since then, expanding from a home-run start-up to a fully fledged company based in north London. The emphasis is now on Fiesta’s own toy designs and their ranges have grown to include baby toys, fabric wall hangings, hand and finger puppets, magnetic activity charts, wooden puzzles and lots of wood and fabric toys. The company is rightly proud of their reputation which is founded on approach to design which ensures that their unique products are always designed with the child in mind. You can be sure that if there’s silence coming from the other room, it’s because your children are concentrating hard on enjoying their play. Learning through play is a crucial part of Fiesta Crafts' ethos. Their toys for babies and toddlers facilitate the development of hand-eye coordination and problem solving, as well as teaching them about shapes, animals and objects. You can see this too throughout their wide range of wooden jigsaw puzzles. Each have different challenges and designs which cater for the youngest toddler through to the puzzles which even adults will find the harder levels more baffling! Expressing yourself through creativity is a hugely important part of any child’s learning. Fiesta's Magnetic Mosaics have been designed to encourage art involvement - with more than 1400 mosaic tiles and eight starter designs in each pack, they are ideal to help children to follow patterns and intricate designs to build a completed mosaic picture. When children are old enough to want to express their creative side in other ways, the company's range of puppets and finger puppets can help them bring creatures to life. Their soft fabric theatres can provide the ideal stage for the budding (finger) actors among your little ones. As with all Fiesta Crafts’ products, parents love them just as much - not just for the pleasure it brings their children, but also for the quality and care that have gone into making them which also means that they will last for many years. Fiesta Crafts are proud to have created a range of toys that make the lives of parents easier by being fun and friendly, to allow children to grow up and take happy memories with them into adulthood.